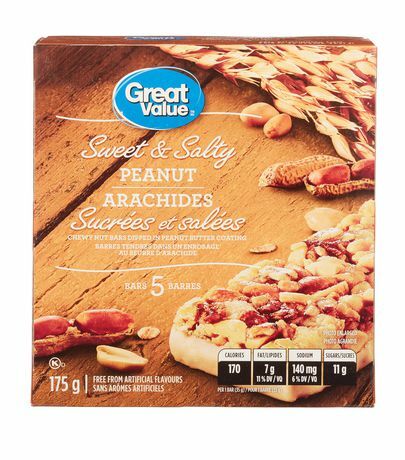 You get the best of both worlds "sweet and salty" at a budget-friendly price with delicious Great Value Peanuts and Yogurt Flavoured Coating Chewy Granola Bars. 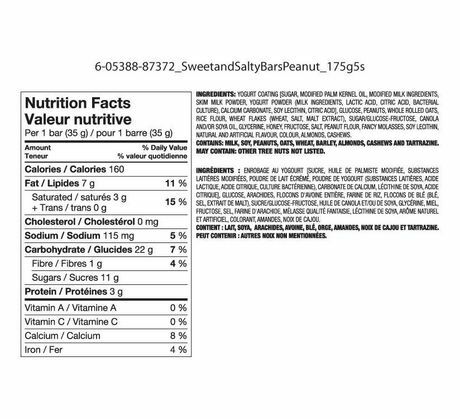 With 5 individually wrapped bars in each box, you will be ready for kids' school lunches, family picnics and car rides. 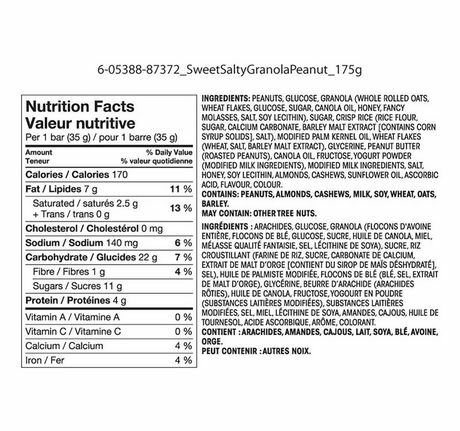 Peanuts, glucose, granola (whole rolled oats, wheat flakes, glucose, sugar, canola oil, honey, fancy molasses, salt, soy lecithin), sugar, crisp rice (rice flour, sugar, calcium carbonate, barley malt extract [contains corn syrup solids], salt), modified palm kernel oil, wheat flakes (wheat, salt, barley malt extract), glycerine, peanut butter (roasted peanuts), canola oil, fructose, yogurt powder (modified milk ingredients), modified milk ingredients, salt, honey, soy lecithin, almonds, cashews, sunflower oil, ascorbic acid, flavour, colour.Contains: Peanuts, almonds, cashews, milk, soy, wheat, oats, barley.May Contain: Other tree nuts.